I’ve gotten a lot of comments on Instagram relating to my hair, and I figured that with NYE this week, it might be the perfect opportunity to show you how to get perfect curls using a curling wand. I’ve teamed up with Lionesse Beauty Bar and am demonstrating on my hair using their curling wand set that comes with 4 different wand widths. For my signature everyday waves, I like to use the largest size wand width. For tighter spirals, I go down on the width. Before I use any heat tools on my hair (especially since it’s color-treated), I use several products that help protect my hair and produce a smooth manageable finish. (My hair is naturally wavy and loves to go frizzy on me, so I also find that these help with that as well.) I’ve used Biosilk Silk Therapy on my hair since high school – it’s a favorite of mine and leaves my hair feeling nourished and super silky. I’ve also started using Kerastase products that are targeted for long hair. The Kerastase Spray Fluidissime is for thermal anti-frizz protection and the Kerastase Cristalliste Cristal Sculpt is a sculpting serum for a glossy shine and light hold. I blow dry my hair straight with a paddle brush and leave it slightly damp. Here’s the secret to the volume in my hair. I separate the hair above my ears and roll it into a loose, poofy bun on the top of my head. The damp roots will dry while it’s up instead of while it’s lying flat giving it more volume at the roots! I leave this loose bun while I curl the bottom layers of hair. I start on the bottom layers of hair first allowing the roots to dry with volume. Curling AWAY from my face on both sides, I’ll curl small sections of hair moving around my head. Once I am finished with the bottom hair, I take down a small portion of hair from the bun and re-bun the rest. I do this until my entire head is finished. (By that time, the top layers of hair will be bouncy instead of flat!) Once my entire head is completely curled, I run a comb gently through to smooth everything out and then spray with hairspray. But HOW do I not touch the wand? My right hand holds the wand and my left hand wraps the hair around it while never letting go of the end of the hair section as you see in the photos. This will take some time to get used to, but once you get the hang of it, it gets very quick. If you can’t seem to not burn yourself, they do have curling wand gloves also! 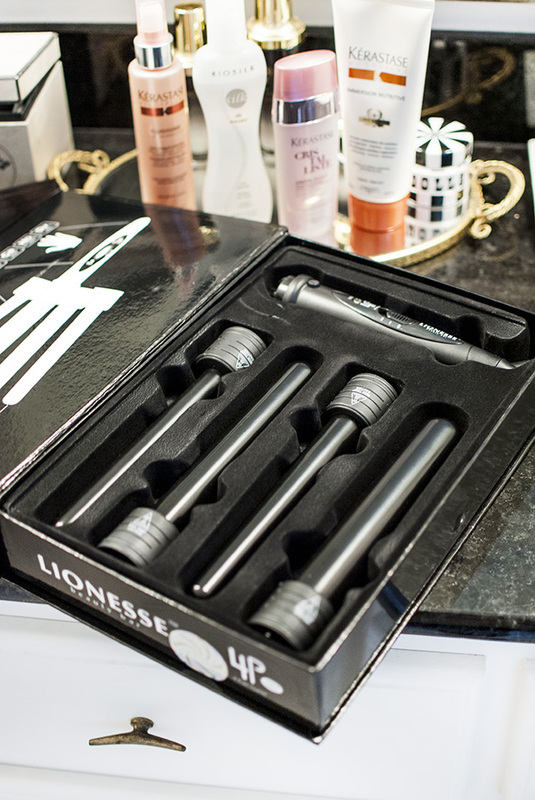 The Lionesse curling wands heat up very quickly and at very high temperatures. This means it will take you less time to curl your entire head. I can literally wrap my hair around the barrel and count to 5 and that section of hair will be perfectly curled – and that’s on the LOW heat setting. The other plus of this wand compared to other versions, the curls last for days. DAYS. Right now, all Lionesse hair tools are 50% off! Visit Lionesse.com for more details on how to get your special promo code! So, there’s my secret to fabulous curls that you can create yourself for New Year’s Eve! If you have any questions at all about the process or the Lionesse wands, please email me at apinchoflovely@gmail.com!